Hydra-Cell Intelligent Pump control delivers just the right flow of coolant to maintain the required system pressure, regardless of tool size. Wanner has announced the introduction of intelligent pump control for its Hydra-Cell high pressure coolant pumps. High pressure coolant pumps usually deal with the tool in the carousel with the largest coolant flow requirement. However, when tools with smaller outlets are used, the superfluous coolant is returned to the supply tank through a bypass valve, which wastes power and heats the coolant unnecessarily, reducing the life of the pump. Hydra-Cell Intelligent Pump control is an open loop system without pressure gauges and complex electrical feedback loops. The company says it delivers just the right flow of coolant to maintain the required system pressure, regardless of tool size. Coolant chillers reduce the power requirement, can be smaller and consume less energy. Pump stress is reduced and operation is quieter as the pump speed is reduced. 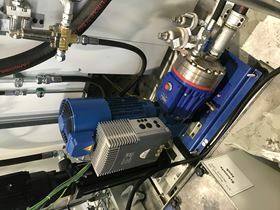 The pump can be programmed to produce individual pressures for each tool in the carousel if required, delivering coolant exactly when it’s needed in the exact quantity, at the exact pressure while eliminating the need for coolant bypass.